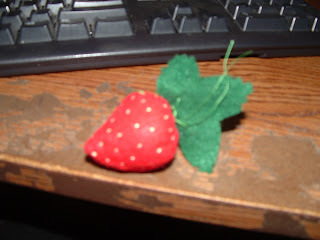 I couldn't help but make these felt strawberries, when I saw them. The tutorial is awesome, so I won't go through the whole thing again here. I did a couple small things different from the original tutorial, though. I also stole Deena's tip for her felt carrots and did the gather stitches in green instead of red. They're not going to show anyway, since they're under the green top and if you cut your thread long enough in the first place, you can use the same thread to sew the green top on...fewer threads to knot and trim. One other tip for the gather stitches. I tied my knot with several extra inches behind the knot. That way you've got a nice tail to tie to the other end after you've pulled the gathers tight. Or course the final thing I did different was that I stuffed the strawberries with chopped up felt scraps instead of stuffing...pretty typical for me. And I had to share Firecracker's attempt at sewing the top on. This picture really doesn't do it justice. She really did a pretty good job and only needed help with a couple extra stitches to get it secured well. One final note about sizes...these will turn out a bit smaller than you expect. I traced two sizes of cans. I used a large juice can (46 oz) for the bigger berries I made. I also used a regular size can for some smaller ones. 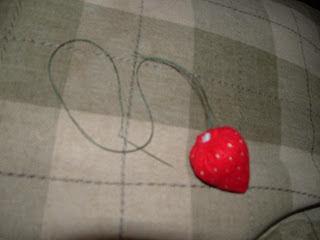 (Firecracker's strawberry above is a smaller one...I actually couldn't find them when I went to take the prettier picture last night.) I would recommend making the bigger ones, especially if you're going to have really young children playing with them. You could even go bigger than the 46 oz can without making them too large. And if you think the chocolate muffins/brownie bites look good, I used the same pattern I'd made for my blueberry muffins. I'm still working on uploading the pattern itself and keep it true to size. If you'd like a printable PDF file, you can email me. I just can figure out how to get it into blogger. When I uploaded it as a JPG, it didn't stay true to size. I look forward to your felt food posts every morning! Thanks for another great link. For your muffin pattern, have you tried scribd.com? I've seen a few other sites use it for adding documents to their blogs. 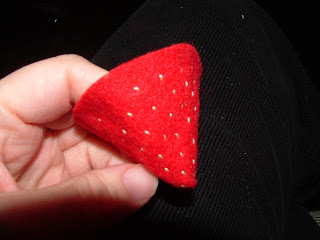 Strawberries were the first felt food I made for my son, using that same tutorial! These are really great! 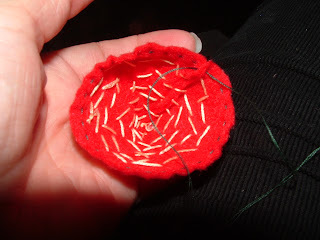 I thought they were felted at first, but this method looks way easier. I'm going to have to make some for the big O. Especially since I just saved one of those plastic containers you get strawberries in from the store. Thanks Polly! Hi! I just wanted to say thank you for all of this! It's really wonderful. I just made these as my first attempt at felt food...soo cute and addictive! I found that tracing a CD made the perfect size. Not huge, but not tiny for my almost 2 yr old (who immediately requested I make more)They look super cute collecting in our lil green berry container! Liz, I'm glad they worked out for you, and thanks for the tip about the CD size. Dont look now but, I, like it,! Polly, these are adorable. 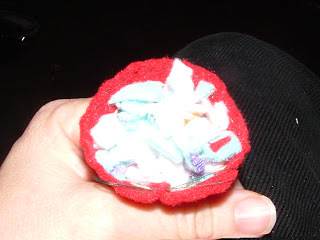 I am making felt food for my granddaughter. When I tried the link to the original tutorial, it said I needed permission and a password to access the page! Any tips on how to access it? Thanks. I am also having trouble accessing the original link! Please help.